Ryan Lanza has allegedly been identified as the shooter in the elementary school shooting in Connecticut, sparking a wave of interest in details about Lanza. Some websites have immediately attempted to find Lanza's Facebook page to find out information, but it now appears as though angry internet users are being directed to other people named Ryan Lanza, and posting comments on their social media pages. 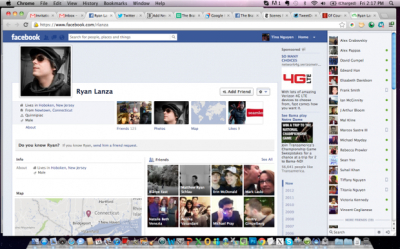 In one such incident, website Mediate.com posted an image of one Ryan Lanza Facebook page describing him as 20 years old with his residence in Hoboken, New Jersey. The Ryan Lanza indicated in the article by Mediate's Noah Rothman had various pictures of a young man with brown hair; one with him pointing his fingers at the camera in a backyard, and others with him wearing a hat and sunglasses. However, as news spread that this was the Ryan Lanza involved in the shooting in Connecticut, the Lanza's Facebook page started posting updates. Within a five minute period the incorrectly identified Lanza posted three messages, the first stating, "IT WASN'T ME I WAS AT WORK IT WASN'T ME." 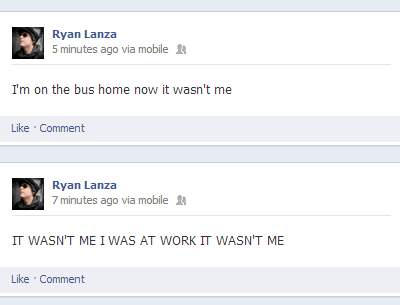 Two minutes after that first post he posted another saying, "I'm on the bus home now it wasn't me." Again, another three minutes after that posting he updated another message saying, "Everyone shut the **** up it wasn't me." Meanwhile, as details of the shooting continue to be released, it has been alleged that one Ryan Lanza was involved in the shooting, and that he was found dead in a classroom at the school. Initial unconfirmed reports have said he was 24 years old, and was found with two firearms when his body was found. It has been assumed that Lanza took his own life following the mass murder, however, police have not yet been able to confirm how he died. It has also been reported that Lanza's mother worked at the Sandy Hook Elementary School in Newton, and that she was one of his victims killed on Friday morning – although it has not yet been confirmed whether she was killed at the school, or somewhere else. Investigators are still working to find out all the details. As at 3 p.m. ET it has been reported that 26 people were killed in the shooting on Friday with at least 18 of those killed being children. President Obama is to address the nation about the killings at about 3.15 p.m. ET.